The best things in life are free – this is certainly true for wild garlic, which is growing like a carpet under the trees in Glenshelane woods near Cappoquin – where its pungent garlicky whiff fills the air. 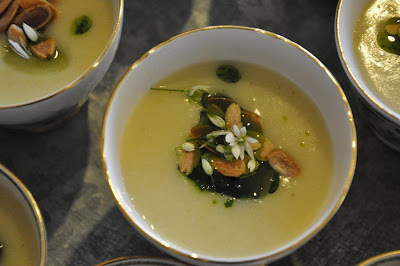 Last week I served this delicious soup at a special spring dinner at Dromana house on the Blackwater. Paul Flynn from the Tannery suggested the addition of green grapes - their sweetness offers a wonderful contrast to the peppery subtle garlicky flavour. A handful of wild garlic, washed. 12 green grapes, halved and deseeded. Melt the butter in a large saucepan over a medium heat, add the onion and potato and sauté gently for 2-3 minutes, add the wild garlic and stock, bring to the boil then reduce the heat and simmer, covered for 15 minutes until the potatoes are cooked. Blend the soup with a hand held blender, check for seasoning, add the cream and heat through. Serve with a swirl of wild garlic oil, some toasted almonds and a pinch of toasted almonds, along with some green grapes. Wild garlic oil is delicious with soups, mixed through pasta and drizzled over roast lamb. It will keep for a week or two in the fridge. Blitz all ingredients together and store in the fridge. To celebrate arrival of spring, I baked a cake. Nearly every house has the ingredients for a beautiful sponge cake - eggs, sugar and flour. There is absolutely nothing wrong with using some good jam as the filling if you don’t want to make the lemon curd. The delicate petals of primroses can be crystallised by simply brushing them gently with beaten egg white, lightly sprinkling with some sugar and leaving to dry overnight. Pre-heat the oven to 170 degrees/gas 3. Grease and line two 20cm sandwich tins. Sieve the flour; I do this twice to aerate it. Using an electric mixer, beat the eggs, sugar and vanilla essence together until the mixture becomes thick and mousse-like and the whisk leaves a trail. This will take about eight to 10 minutes. Using a metal spoon, gently fold the flour into the mixture. Divide the mixture between the two tins and bake for 20 minutes. You will know when the cakes are cooked as they will start to come away from the sides of the tin. Gently remove from the tin and cool on a wire tray. Beat all ingredients together in a heavy-based saucepan until well combined. Place the saucepan over a very gentle heat and stir constantly until thick and creamy. Take off the heat and keep stirring until lukewarm. These adorable little gems can be piled on top of a cake to give it wow factor, or just sandwiched together with lemon curd. Preheat the oven to 120 degrees/gas ½. Whisk two egg whites in a spotlessly clean bowl with a tiny pinch of salt to a soft peak, and then add the sugar until the meringue is stiff and glossy. Divide the mixture in two, adding the tiniest drop of red food colouring to one lot to make baby pink meringues. Line one or two baking sheets with parchment, and drop teaspoons of the meringue mix on to the paper. Place the meringues in the oven. Reduce the temperature to 100 degrees and bake for 45 minutes. Allow to cool in the oven. Spread a generous tablespoon of lemon curd on one of the sponge cakes, followed by half the whipped cream. Place the second sponge cake on top and repeat the lemon curd and cream. Pile some of little meringues on top and finish with some primroses. The is no surer sign that spring has arrived than seeing the beautiful pink rhubarb stalks ripen underneath their canopy of enormous leaves. Spring has arrived a little earlier than usual this year- this is due to the mild winter I suppose. Rhubarb features on my breakfast menu from now until it fades out of season. Did you know how easy it is to grow? Because rhubarb is so hardy it will survive almost total neglect. Once the plant has some mulsh in winter along with a little straw or newspaper to protect against frost it will flourish beautifully - no garden should be without its own clump. The following recipe is for rhubarb compote, this is a great template for many dishes. It is important that you use the younger rhubarb stems as the season moves along the rhubarb gets thicker and coarser. Start off by making syrup, simmering the sugar and water together until the sugar is dissolved. Add the rosewater and rhubarb simmer the rhubarb for 3 minutes then turn off the heat, allowing the rhubarb to cook in the cooling liquid. When the liquid has gone cold, remove the rhubarb with a slotted spoon, then simmer the syrup, dissolve the arrowroot in a little cold water and add to the syrup to thicken - simmer for a minute or two and remove from the heat and allow to cool- at this stage you can add the tiniest drop of pink or red food colour - be very careful with this - less is always better. Return the rhubarb to the syrup. This compote can be used spooned over yoghurt for breakfast, or on desserts and cakes, it will last up to 5 days in the fridge. 225 mls cream softly whipped. To make the pavlova, whisk the egg whites and sugar together until glossy and stiff. Whisk in the corn flour vinegar and rose water. Line a large roasting tin with some grease proof paper and pile the meringue mixture and form into a 9 inch round circle. Turn the oven down to 120˚C. Put the pavlova into the oven and bake for 1 ½ hours. Allow the pavlova to cool in the oven. This stops it cracking. 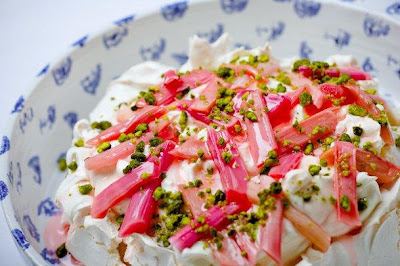 To serve, pile the cream onto the top of the pavlova, and then spoon the rhubarb compote on top, sprinkle with pistachio nuts.